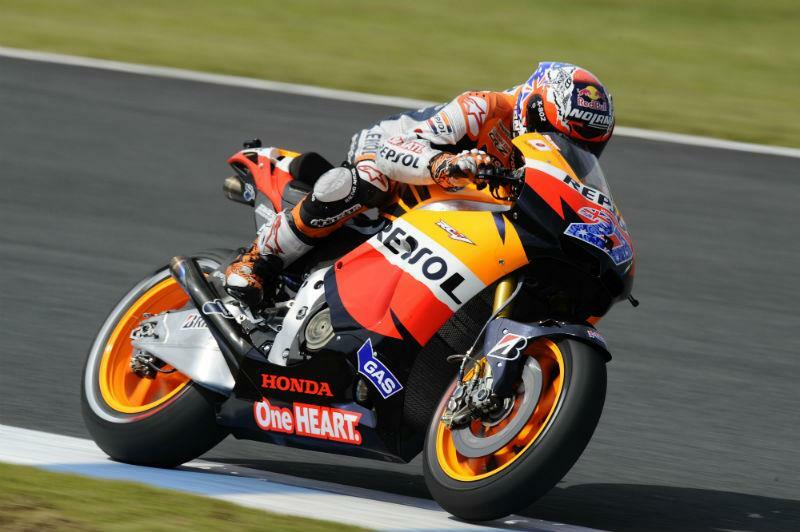 Casey Stoner (Repsol Honda) has secured his tenth pole position start of the season at the Twin Ring Motegi circuit in Japan with a time of 1'45.267 - 0.02 seconds faster then Jorge Lorenzo (Yamaha Factory Racing) who will start from second. Repsol Honda rider Andrea Dovizioso will complete the front row, qualifying in third after setting a lap of 1’45.791 and demoting team mate Dani Pedrosa to fourth by less than 0.02 seconds. Yamaha Factory Racing rider Ben Spies follows Pedrosa, starting from fifth on the grid having fought off food poisoning that forced the American rider to retire from the second practice session after five laps. Marco Simoncelli (San Carlo Honda Gresini Team) completes the second row on the grid in sixth, setting his fastest lap after returning to the track following a fall at turn five halfway through the session. Valentino Rossi (Ducati Team) qualified in seventh place, setting a best lap that was just over one second slower than Stoner's best. Spaniards Álvaro Bautista (Rizla Suzuki) and Héctor Barberá (Mapfre Aspar) complete the third row in eighth and ninth. Nicky Hayden (Ducati Team) qualified in tenth, ahead of Hiroshi Aoyama (San Carlo Honda Gresini) in eleventh. Cal Crutchlow (Monster Yamaha Tech 3), on his first visit to the Japanese circuit, qualified in twelfth two places ahead of team mate Colin Edwards who fell in the gravel in the first 15 minutes, but was able to rejoin the session.